MADISON – Assisted by hundreds of volunteers around the state, University of Wisconsin-Madison researchers and their cooperators have developed a method of assessing the water quality of Wisconsin's lakes from space. Satellite imagery provides researchers with valuable tools for assessing a wide range of natural resource issues. This image gallery provides examples of images used by scientists at the University of Wisconsin-Madison to assess lake water clarity. An additional gallery focuses on the southern portion of Lake Winnebago at Fond du Lac. Wisconsin has nearly 15,000 lakes. This 36" x 48" map shows the estimated clarity, or transparency of the 8,000 largest of those lakes as measured by satellite remote sensing. It is the first ever complete map of water clarity for the State of Wisconsin with such detail. Click here for webpage version of the map text. *Full-resolution = 36" x 48" at 150 dpi and is 4.13 MB in file size. Windows (IE): Right-click thumbnail to "save target as..."
Macintosh (NN or Safari): Click-hold thumbnail to "download link to disk"
** Awarded "Best in Class" for Map Poster category at the 2003 Wisconsin Land Information Association (WILA) meeting in Milwaukee. SLOI - Satellite Lakes Observatory Initiative - coordination and technical information site for Self-Help volunteer network. MODIS ImageServer, "MODIS-Today" providing daily satellite images of Wisconsin, and the rest of the United States. The host of this website, the UW-Madison Environmental Remote Sensing Center (ERSC). The Self-Help Citizen Lake Monitoring Program, a network of citizen volunteers collecting data on hundreds of lakes statewide in Wisconsin. Search the Self-Help database to find data on any of the lakes sampled by the volunteers. The Wisconsin Department of Natural Resources. The UW-Madison Center for Limnology and the North Temperate Lakes Long-Term Ecological Research Site. A summary of research on regional water clarity in Minnesota, Wisconsin, and Michigan coordinated by the Upper Midwest Regional Earth Science Applications Center (RESAC). 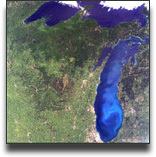 NASA, which supports research on satellite remote sensing of lakes at UW-Madison through the Earth Science Enterprise (ESE) and its Affiliated Research Center (ARC) program. 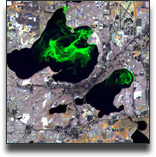 The NASA Landsat 7 Page and the USGS Landsat Program, both providing general information about the Landsat-7 satellite. Landsat.org, our favorite source for Landsat data and previews. The North American Lake Management Society (NALMS).